It’s probably safe to say that the Easter Bunny will leave at least some candy in most of the Easter baskets he visits. But plenty of parents prefer that the E.B. 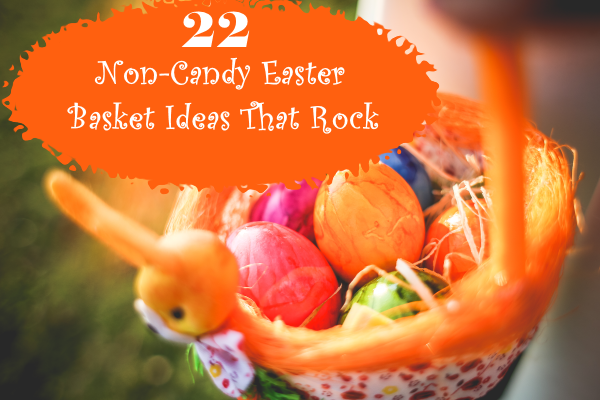 find some non candy Easter basket ideas. Here’s a list of my favorite non candy Easter basket ideas. Some of them are bound to strike your kid’s fancy. Pick up individual Play Doh cans at Walmart for less than $1, or take a look at this Play Doh Mega Pack (36 Cans) , which can be split among many kids, if desired. Art supplies offer wonderful non candy Easter basket ideas. Kids will delight in receiving watercolors , watercolor paper or a Melissa & Doug Drawing Pad . Drugstores and Walmart sell musical toothbrushes, available in a number of different songs. Our family dentist recommended trying a musical toothbrush to get the kids to brush their teeth longer, since the song plays for exactly two minutes – the time you’re supposed to spend brushing your teeth. My girls’ preferred song is “What Makes You Beautiful” by One Direction, on the Tooth Tunes toothbrushes, but there are other brands and many other song choices. This list provides a number of great options for My Little Pony licensed products such as shirts, cups, hoodies and toys that are great for Easter baskets. Kids crazy for Minecraft? It seems like almost every parent I talk to says their kids want to play Minecraft all the time. Here’s a long list of Minecraft Easter basket ideas, such as shirts, Enderman hoodies and characters like squids and creepers. Stickers are high on the list of preferred Easter basket ideas for many young kids. It would be a good plan for the Easter Bunny to leave some notebooks or other paper with the stickers, so that kids aren’t tempted to put their stickers on carpets, clothing and furniture. Some great sticker choices include this Frozen Ultimate Sticker Book and these Disney Frozen sticker sheets . Small dolls and action figures are just the right size for non candy Easter basket ideas. Fans of “Big Hero 6” might like this Big Hero 6 Baymax . My daughter has this Disney Frozen Complete Story Playset and adores it. It includes miniature figures of all the major Disney Frozen characters, including Elsa, Anna, Olaf and Sven. My 11-year-old has been crazy about Webkinz for years. She also adopts the Webkinz online using codes that come with them, so she can play games and otherwise interact with the virtual versions of her dozens of Webkinz stuffed animals. Amazon has some good deals on Webkinz right now, selling them for $5 to $7, which is about 50 percent off retail. Check out the Webkinz Velvety Elephant , Webkinz Hedgehog , Webkinz Pom Pom Kitty and Webkinz Rabbit . Many kids love to cuddle up with their favorite characters. The Easter Bunny could leave a Disney Frozen Tapestry Throw or a Dora The Explorer blanket . The E.B. could also bring licensed sports team items, such as an NFL team fleece blanket . Check out Amazon’s bestselling children’s books , grouped by age, theme and much more, to select the right books for the Easter Bunny to leave. Here’s a list of my kids’ favorite books for preschoolers. The Easter Bunny has numerous choices for sure-to-please coloring books as Easter basket ideas. Try a Journey to the Ice Palace Disney Frozen Jumbo Coloring Book , Dreams Come True Forever Disney Princess Jumbo Coloring Book or Fun all Year Thomas & Friends Super Coloring Book . It won’t be long now before kids can play in the sand or pool or go to the beach. Easter basket ideas in this category include this Sprinkler Bucket Play Set, a cool Ice Cream Sandwich Pool Float, a delightfully pink Giant Inflatable Donut Pool Float or this fantastic 15-Pieces Beach Sand Toys Set in Zippered Bag Castle Bucket . The Easter Bunny might drop some fancy sunglasses into the basket, such as these adorable pink polka dot ones or these sporty ones. Bath toy Easter basket ideas include this Cookie Monster Bath Submarine Toy, a Bathtime Blink and Float Octopus Toy and a Rub a Dub Draw in the Tub Set. Sidewalk chalk is so much fun, and kids can draw on sidewalks, driveways and parking lots. The chalk easily washes away next time it rains, making room for your kids’ next masterpieces. The Easter Bunny could select this Sidewalk Chalks Pack or this Mega Sidewalk Chalk. The Easter Bunny can find plenty of bubble making options, such as Bubble Oodles, Juggle Bubbles or this Disney Frozen bubble set . We have the Frozen bubble set, and it’s wonderful. Be sure to pick up some extra bubble liquid , since bubble sets invariably come with a very small bottle which runs out quickly. Puzzles make fantastic Easter basket ideas. Check out this Doc McStuffins Puzzle Pack and this Butterfly Garden 1000-piece puzzle. One of my girls has this Disney Frozen Puzzle in Tin with Handle (48-Piece) , which is really nice. The sturdy metal case could be used as a lunchbox. My kids love to build with LEGO blocks, and the Easter Bunny has a huge assortment of LEGO sets to choose from. There are building kits such as a LEGO Disney Princess Ariel’s Magical Kiss , a Camper Van LEGO City Set and a LEGO City Fire Truck . Or, the E.B. could pick up a giant set of LEGO building blocks such as the LEGO Bricks & More Builders of Tomorrow package. Rubik’s Cube was all the rage when I was a teenager. It was fun, and kids still enjoy playing with them. Amazon sells Rubik’s Cubes , and Walmart probably also has them. The Easter Bunny can find many other small, handheld games at Walmart and on Amazon.com, too. These are fantastic for long car trips or anytime kids need to stay occupied. Walmart and Target often have great deals on card games like the classic Uno. Even plain old playing cards make great non candy Easter basket ideas. Teach the kids to play go fish or blackjack. Since the new Frozen short, Frozen Fever, came out, licensed products have followed, such as a Disney Frozen Fever Elsa Doll and this Girls Frozen Fever Elsa, Anna, And Olaf Circles T-Shirt. I had tons of stuffed animals when I was a kid, and even as a teenager. My girls have collected quite a large store of them as well. This adorable Melissa & Doug Princess 14″ Plush Burrow Bunny is among Amazon’s most popular Easter basket ideas.